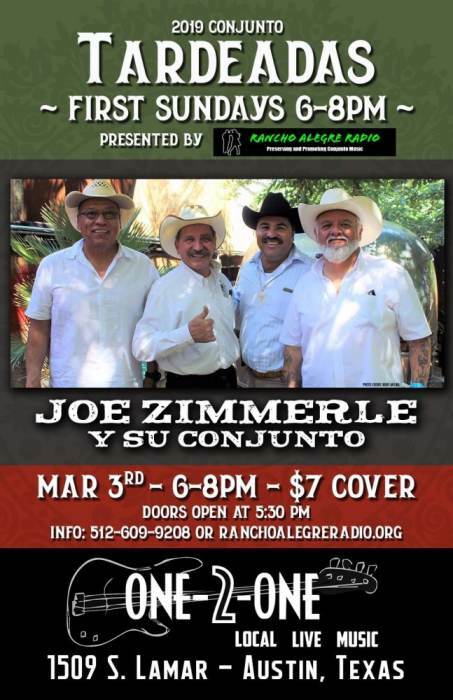 Rancho Alegre Radio's First Sunday Conjunto Tardeadas are back! Join us Sunday March 3rd as we return to One-2-One Bar! 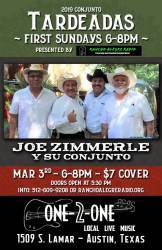 Join us as we welcome Joe Zimmerle y Su Conjunto to One-2-One for the first time! After a couple of years with Los Thunderbirds, bandleader and drummer Joe Zimmerle is continuing the famous San Antonio Zimmerle family tradition with a rock-solid conjunto of his own, which he founded last year. The group has already recorded a couple of singles and is hard at work on their first album. You'll love their classic west side San Anto sound easy going vibe - PERFECT for a tardeada! $7 cover, doors open at 5:30pm, music from 6 to 8 p.m.
You can bring your own food, but not your own drink. Be sure to tip the bartenders! One-2-One Bar is located at 1509 S. Lamar, Suite 600, on South Lamar between Oltorf and Barton Springs. Come on out, invite your friends!